This guide should be used for authenticated items only. The guide provides pricing for items that have already been certified by a respected third party authenticator. Regardless, the prices listed in this guide represent what the items should approximately sell for if in fact they were certified. This price guide provides pricing for autographs that are ungraded but considered to be in NM-MT condition. Remember, although SMR does its absolute best to reflect the current market for autograph prices, the prices listed should only be used as a guide when buying and selling autographed items. Please refer to the autograph chart and to the section below, "A Note about Autograph Pricing," for further explanation. Autograph pricing can be, at times, a difficult task. There are many factors to consider when placing a value on an autographed item. Condition, rarity, eye appeal and age are just some of the factors used in evaluating autograph pricing. For example, when you have an autographed team ball, many collectors assume that you simply add all the individual signatures to come up with the value. That is not the case. 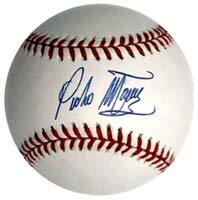 While team signed baseballs are great collectibles, single signed items are considered more desirable than those items that are signed by multiple players. Another pricing dilemma occurs when the condition of the autograph and the item itself differ. A baseball maybe in mint condition but the autograph may only grade a 4 or 5 on a scale of 1 to 10. The situation is the same for items that are signed perfectly but the items themselves may be in poor condition. In addition, a player may rarely sign certain items such as game used equipment or the player may not sign often with inscriptions. 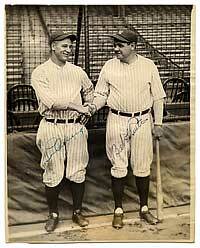 All in all, there is a lot to consider when determining the value of autographed items. I have provided a general condition chart that should be used as a base only because, as it was stated above, autograph pricing can vary a great deal. Baseballs - There are several factors that contribute to the value of autographed baseballs. First, as a general rule, baseballs are valued higher if they are signed on the sweet spot as opposed to the side panel. Sweet spot autographs are much easier to display and therefore command a premium price. On the other hand, many players, especially those from the vintage era, signed on the side panel often. Baseballs signed on the side panel offer an affordable alternative to those on the sweet spot. Second, official league baseballs are generally valued higher than non-league baseballs. Third, baseballs that are harder to locate such as World Series baseballs or scarce versions of regular season baseballs command a premium. Fourth, personalized baseballs such as "To Jack" are valued less than non-personalized baseballs. 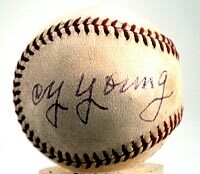 Finally, the condition of the baseball itself, regardless of the condition of the autograph, is also a major factor in determining the value. Coloring (whiteness), scuffing, shellacking (a glossy coat to preserve the autograph), staining and overall wear are all key factors in determining the value of autographed baseballs. The general and simple rule is the better the eye appeal, the higher the value. Photos - When determining the value of an autographed photo, there are a few factors to consider. The photo may have corner wear or slight edge wear without detracting significantly from the value but any wear or damage that detracts from the image itself will lower the value considerably. Also, as with baseballs, personalized autographs will lower the overall value. Other major factors include rarity of the photo, historical importance, picture quality and overall eye appeal. Photos are usually used as display items so the eye appeal is very important. The prices in this guide are for 8x10 (modern) or smaller (vintage) photos. Documents - The keys to determining the value of an autographed document are overall condition and content. Many letters will have folds or bends in them because of the mailing process so, as long as there are no major flaws such as tears or staining that affect the content, the value won't be affected very much. Content is another major factor. As a general rule, the more sports related content, the higher the value. There are instances where non-sports content may worth more; it simply comes down to how interesting the content is. Another content-related factor revolves around the amount handwriting found in the document. With all other things being equal, if a letter is handwritten, it is usually worth more than a letter that is typed. Collectors seem to like the personal touch the handwritten pieces offer. Bats, Gloves, Jerseys and Helmets - This guide should be used for non-game equipment. Autographed game issued or game used equipment would command a much higher premium than the prices listed in this guide. The autographed bat, glove, jersey and helmet prices listed are for replica or commemorative-type items. General condition principles apply. Flats - General condition principles apply to all other miscellaneous flat items. As stated earlier, autograph pricing is a very difficult task when you consider the amount of subjectivity involved. At SMR, we will do our very best to track the market on all of the items listed and add new items as needed. We hope this information proves to be useful in determining the values of your prized autographed items. Remember that autographs authenticated in the presence of the signer will usually sell for a premium price, sometimes a major one, when the service provided includes certification (usually accompanied by a sticker, hologram or DNA) from a respected company in the industry. The bottom line is autograph collecting or any other area of collecting is that you get what you pay for. 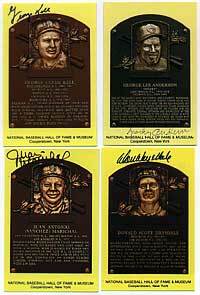 There is great value in buying authenticated autographs. Not only are they more liquid when it comes time to sell them but you absolutely know you are getting the real thing. Major premium prices apply to autographs of this quality and for very good reason. Black and White issued before 1963. Gold card issued after 1963. For instance, it is impossible for Grover Alexander to have signed a Gold Hall of Fame plaque card because he passed away prior to issuance. For instance, Gil Hodges was never inducted into the Hall of Fame, therefore the Hall of Fame plaque cards will not apply to him.